I mentioned earlier that I would follow the Flash anywhere at this point, and this comic is a good example of that. The appearance of the Scarlet Speedster on the cover is the only reason I picked up this issue of WONDER WOMAN, and I was embarrassed to do it even so, in that way tat only kids can be embarrassed when they feel like something isn’t meant for them. I would have been mortified somehow if any of my young friends found me with a copy of WONDER WOMAN, somehow. 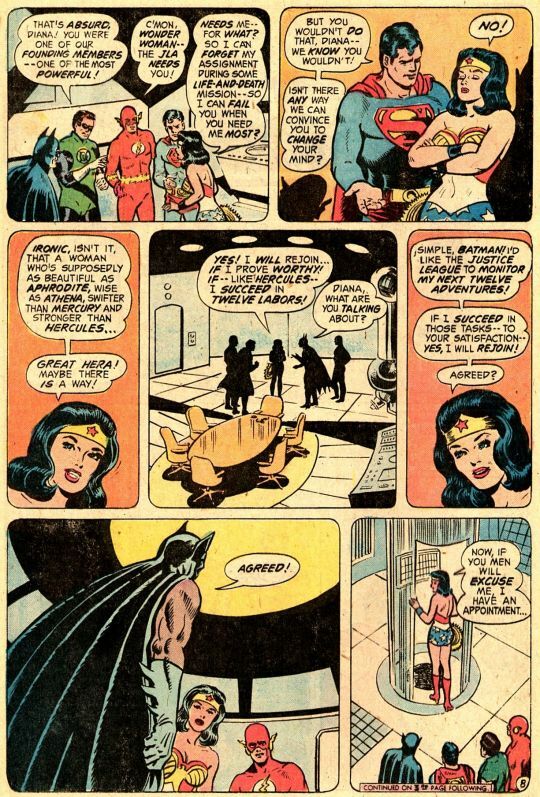 At this point in time, WONDER WOMAN was something of a book on the ropes. The years-long experiment with removing Diana’s powers and recasting her as akin to Emma Peel had run its course, struck down in part by protests from Gloria Steinem’s MS. magazine. And so, Wonder Woman regained her Amazon powers, but not any sense of direction. Editor Robert Kanigher produced a bunch of silly stories attempting to replicate the earliest tales of the character, with little success. I have a vague sense that I once owned one of these books prior to this, that came in one of those 3-bags. 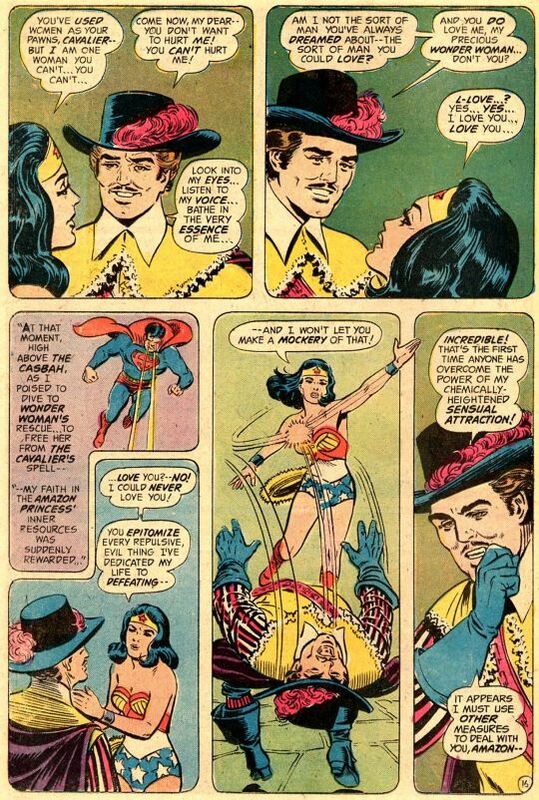 WONDER WOMAN was clearly a series that was adrift, and this issue coincidentally was the first step in attempting to right the ship. 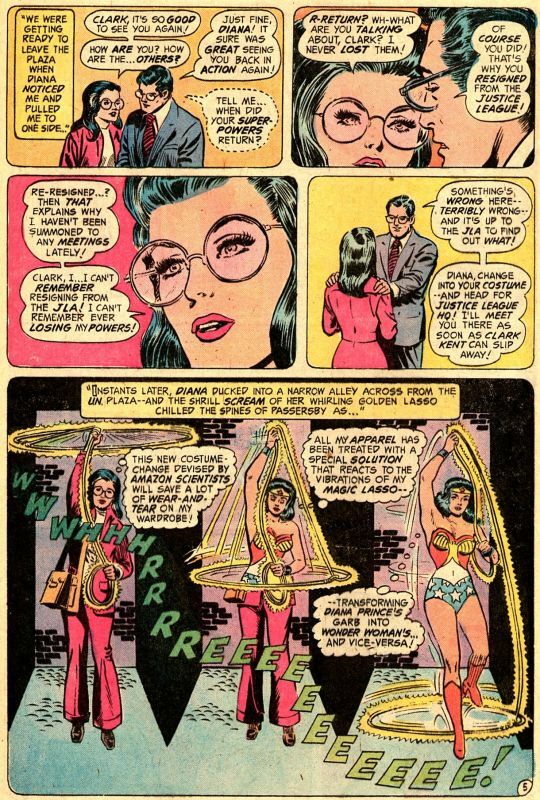 The series had been handed over to my favorite editor, Julie Schwartz, and Julie had enlisted writer Len Wein and artist Curt Swan to try to recapture the magic of the character. This is already more effort than anybody had put into Wonder Woman for a long time. 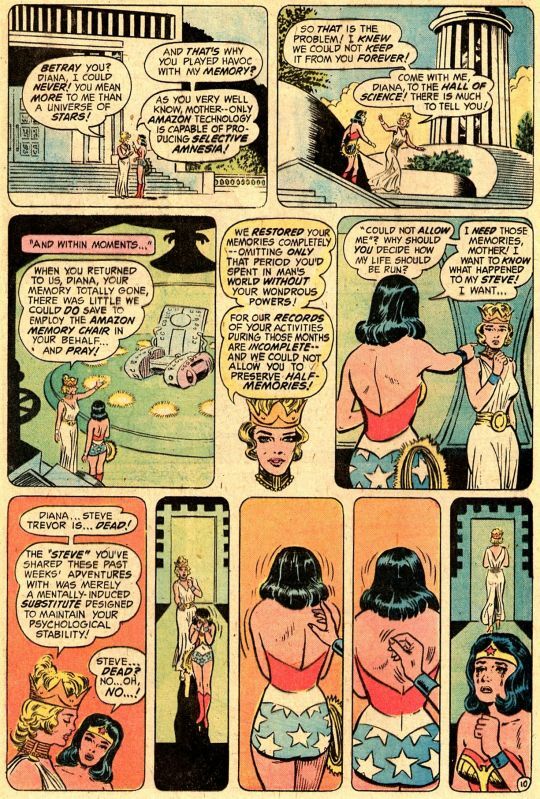 Once she realizes that there are gaps in her memory–including any recollection of Steve Trevor’s death–Wonder Woman vows to get tot eh bottom of things. 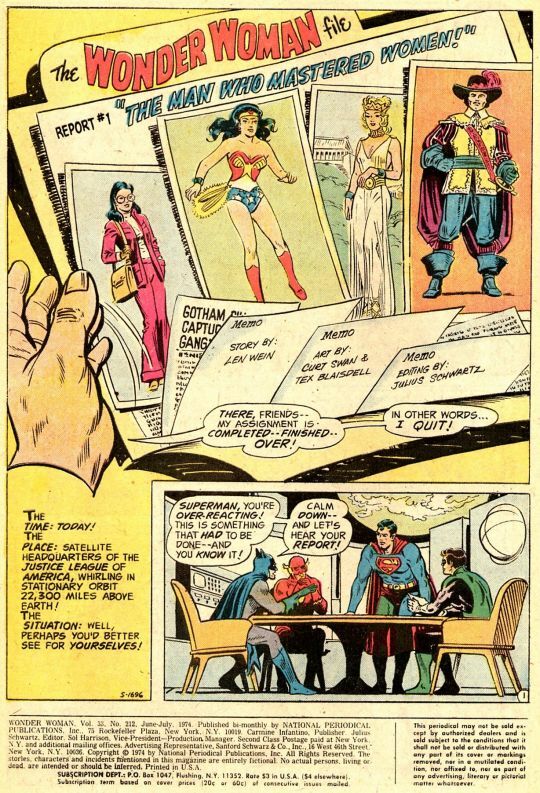 But because she cannot trust herself, as a condition of re-entry into the Justice League, she asks her fellow members to monitor her next twelve exploits, to evaluate whether or not she is competent to rejoin the team. This is a cool move by Len, setting up a dozen stories each of which will guest-star a JLA member as an observer, and maybe lure some readers (like me) into checking these issues out. Len and Julie also devise a memorable new transformation for Diana. When she wants to go from U.N. Translator to Amazon Warrior, she twirls her lasso about herself from head-to-toe, and is magically changed. This lasted for several years, and was the inspiration for the television series’ change-twirl. 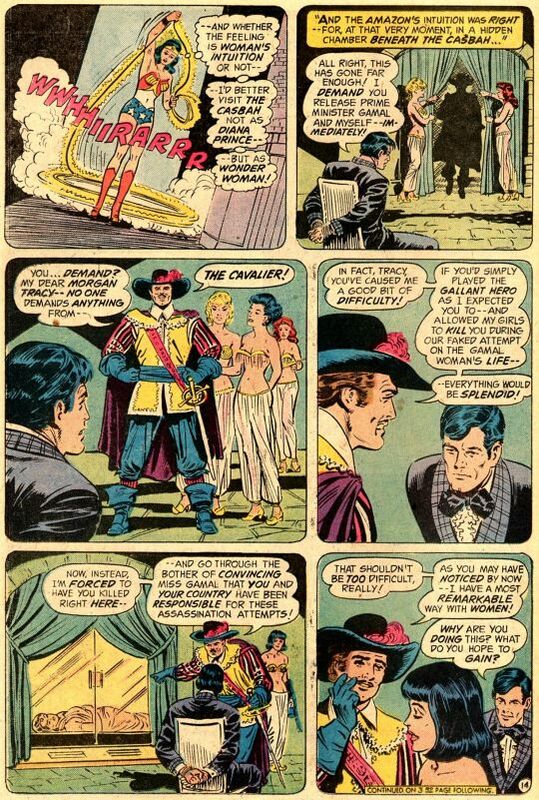 Superman is appointed to shadow Wonder Woman on her first exploit, which finds her searching for U.N. Crisis management Chief Morgan Tracy, who has fallen afoul of one of Batman’s old enemies, the Cavalier. The Cavalier is using a powerful pheromone that allows him to dominate the women he surrounds himself with. It almost works on Wonder Woman, but not quite. Diana proceeds to take everything the Cavalier can dish out, and hands him his head handily (aided by the women he had mentally controlled earlier.) The grateful Tracy is poised to make Diana Prince a part of his Crisis team. And Wonder Woman has passed her first test without the need for a save from Superman. 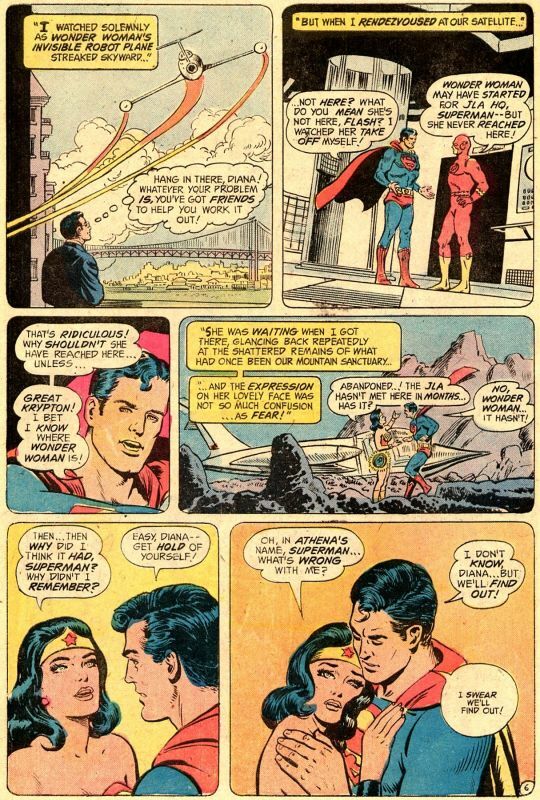 Superman does reveal that he did help out Wonder Woman a little bit secretly during the adventure. And he selects his successor as Diana’s keeper for the following issue: The Flash. This, of course, meant that I was going to have to read that next issue as well. 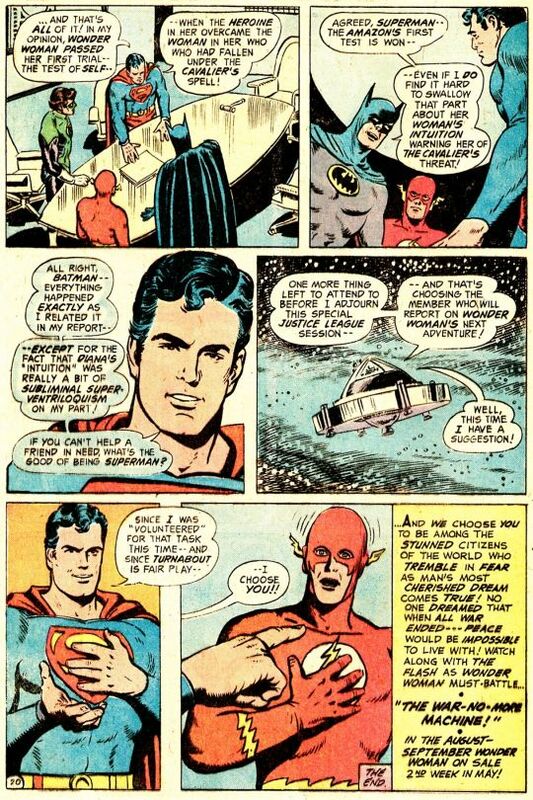 (That drawing of the Flash also looks crude enough that I suspect that it was originally Batman that Superman pointed to, but for some reason a change was made at the last minute.) Which didn’t seem like a chore, as this story was very much in keeping with what I liked so much about the various issues of Julie’s other titles that I’d sampled.